Litter planned late fall of 2019. I’ll be setting up appointments in the summer to meet us. The process to reserve a Dees Golden’s puppy. An appointment is set up to come meet my furkids and me. If you’d like to reserve a puppy during your visit a small deposit is placed on that females list. The order of deposit is the order in which the puppies are chosen. My goal is to raise healthy, even tempered puppies. They are bred for temperament first and to the Golden Retriever standard for conformation. 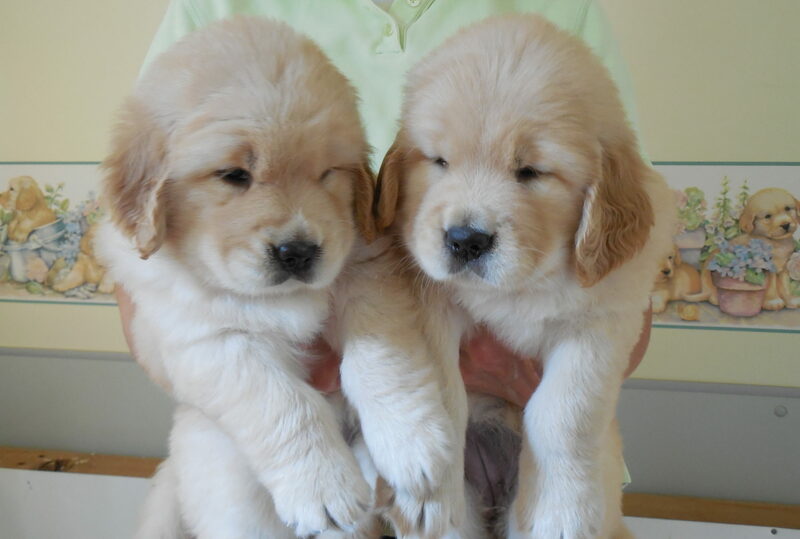 Therefore, planned breeding is done to ensure a quality Golden Retriever puppy. The parents are screened for congenital defects. Their pedigrees and health documents are available to view. Since I have been a breeder for 28 years, I have many repeat buyers and referrals. Many of my furbabies have gone on to become Therapy dogs and have AKC obedience titles. I’m a hobby breeder who believes that my dogs are family members first and foremost, so all of my puppies are sold as companions. Please e-mail or Call me. My cell: 401.447.9468 or Home 401.348.0633 Please leave a message. This entry was posted in Uncategorized on April 25, 2016 by ray.